At the risk of tempting fate, it seems that spring is here to stay. Temperatures are climbing and the gardens at Heronswood are full of the charming early-bloomers that help us shake off the winter chill. 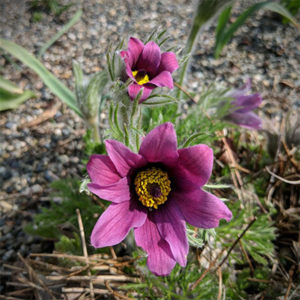 One that always deserves a closer look, and whose common name reflects the season itself, is Pulsatilla grandis, the greater pasque flower. Pulsatilla grandis is the eastern European cousin to the perhaps more familiar Pulsatilla vulgaris, which is native throughout much of western Europe, and the North American P. patens and P. occidentalis. 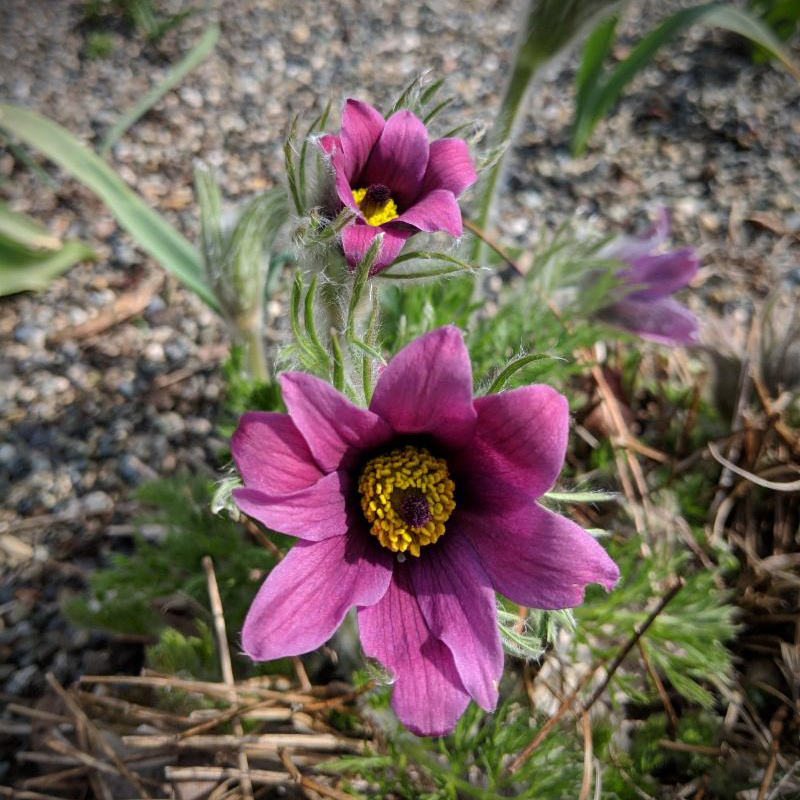 Pulsatilla bloom in a variety of pastel shades, but the flowers of P. grandis are consistently within a lavender to rich purple range, five-petaled, and with a burst of butter yellow stamens. They’re reminiscent of some Anemone or Ranunculus for good reason, as all are members of the Ranunculaceae family. Regardless of color, the large blooms always stand in nice contrast to the lacy, almost furry, gray-green mounds of foliage, whose velvety appearance lends both nice contrast to a rock garden planting and also confers some drought tolerance to the plant itself. Despite its somewhat delicate appearance, this is a fairly tough, reliable plant. In the wilds of eastern Europe, it is a frequent resident of lime soils in dry grasslands and scrublands, and the North American species is at home in our prairies and grasslands (and has the charming name of prairie crocus). It evolved to tolerate occasional drought and poor soils, so plant accordingly. The P. grandis at Heronswood are happily blooming now in our gravel bed behind the Garden House and will soon be followed by a succession of cultivars of P. vulgaris, like the strikingly scarlet ‘Red Bells’. It will thrive for you in a well-drained, sunny rock garden, and, true to its name as the pasque or Easter flower, cheerfully herald the arrival of spring, no matter how harsh the winter.